For exactly this purpose we do supply the ASTF-series of mounted solar filters. The fastening rim on which the film is affixed to has the same expansion coefficient as the film itself. and that very ring is free-floating in the cell that mounts onto the telescope tube. Hence there is no stress build-up extended onto the film as it shrinks with temperature variation. The film itself will not be harmed by temperatures between -50°C up to +50°C. Below the film will become stiff and further below (- 100°C) even brittle. Above 50°C the adhesive that fastens the film onto its mounting-ring may start to become soft - in case that temperature persists for longer than 24 hours. 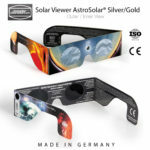 Please visit our website www.astrosolar.com/en/faqs for many questions and answers on our solar products, such as AstroSolar Film, Solar Viewers and mounted Baader Solar Filters. Photosphere and limb are a combination of white light solar terrestrial peaks and NIR. Chromosphere and Corona flows are primarily NIR. Stack and align two images taken less than 15 seconds apart (otherwise there is blurring). Gimp: Grain extract, copy result as new layer - color curves, bisect the spike. Contrast and brightness to your liking. The Sun is never boring. Enjoy the plasma zoo. Wenn man bedenkt, was Filter üblicherweise kosten, ist das eine sehr faire Alternative. das Beste daran ist aber die hohe Qualität trotz des Eigenbaus. Ich war zunächst skeptisch, als ich das las, habe meine Meinung aber geändert. Super Produkt, wegen der höheren Dicke im Vergleich zu anderen bedampften Folien hervorragend bearbeitbar, die beidseitigen Deckblätter sind ein guter Schutz und können während des Zuschneidens auf der Folie bleiben. Ich habe nach der Anleitung Filter für ein 400er Spiegeltele und für ein Steiner-Fernglas 7×20 gebaut. Es ist noch die Hälfte des Bogens übrig, so dass es auch noch für eine HD-Cam und weitere Objektive reicht. Vielen Dank an Baader-Planetarium und eine uneingeschränkte Empfehlung für dieses Produkt!